Following three consecutive monthly increases, retail sales decreased 0.8% in December to $49.6 billion. Despite this decline, retail sales were up 1.5% in the fourth quarter and up 6.7% for the year. Sales fell in 6 of 11 subsectors, representing 42% of retail trade. Lower sales at general merchandise; health and personal care; and electronics and appliance stores more than offset gains at motor vehicle and parts dealers and food and beverage stores. Excluding motor vehicle and parts dealers, retail sales decreased 1.8%. Retail sales in volume terms were also down 0.8% in December. After reporting increases in October and November, sales at general merchandise stores were down 5.3% in December. Sales at health and personal care stores decreased 3.8%, mainly due to weaker sales in Ontario. Following a 12.7% increase in November with new product releases and strengthened promotional activity surrounding Black Friday, sales at electronics and appliance stores were down 9.1% in December. Sales in this subsector grew 7.2% in the fourth quarter. Motor vehicle and parts dealers reported a 2.1% increase in December, following a 3.4% decrease in November. Higher sales at new car dealers (+2.9%) more than offset declines at used car dealers (-1.3%), other motor vehicle dealers (-1.6%), and automotive parts, accessories and tire stores (-0.7%). Receipts at food and beverage stores increased 1.4%, primarily due to stronger sales at supermarkets and other grocery stores (+1.6%). All other store types in this subsector reported gains. While sales fell in six provinces, the overall decline in retail sales was largely attributable to Ontario (-1.6%), which registered its first decrease in six months. Retail sales in the Toronto census metropolitan area (CMA) were down 1.9%. Sales in British Columbia declined 0.6%. The Vancouver CMA (-1.4%) posted its third decrease of 2017. Following two months of gains, Quebec edged up 0.1% in December, on the strength of higher sales in the Montréal CMA (+0.5%), up for the third consecutive month. On an unadjusted basis, retail e-commerce sales totalled $1.9 billion in December, accounting for 3.4% of total retail trade. On a year-over-year basis, retail e-commerce increased 4.1%, while total unadjusted retail sales rose 3.2%. Sales at Canadian store retailers grew 6.7%, the highest annual growth rate since 1997, reaching $588 billion in 2017. The increase was partially attributable to higher prices, as sales in volume terms were up 5.4%. Sales were up in every province, with Ontario (+6.4%) leading the way. Retail sales bounced back in Alberta (+7.5%) following declines in 2015 and 2016. Sales in the retail sector picked up in 2017 on the strength of improved labour market conditions in Ontario, Quebec, British Columbia and Alberta. Based on Statistics Canada's Labour Force Survey, employment increased by 427,000 from December 2016 to December 2017, as Canada's unemployment rate fell by 1.1 percentage points to 5.8%, one of the lowest rates on record. Following a slide in employment from the autumn of 2015 to the summer of 2016, the labour market in Alberta added 55,000 workers in 2017. The unemployment rate fell from 8.6% at the end of 2016 to 7.0% at the end of 2017. These gains played a role in stronger retail sales in Alberta, where sales were down in both 2015 and 2016. In 2017, Canada surpassed two million new motor vehicles sold in a single year for the first time, as an 8.1% increase in units of trucks sold more than offset a 2.1% decrease in passenger vehicles. In dollar terms, sales at motor vehicle and parts dealers (+9.0%) were the largest contributor to the increase in retail sales in every province except Manitoba. Sales at gasoline stations increased 12.9%, as gasoline prices continued to recover following sharp declines between mid-2014 and early 2016 due to a significant downturn in the global price of oil. According to the Consumer Price Index, the average price of gasoline was 11.8% higher in 2017 compared with 2016. Removing the effects of price changes, sales in volume terms at gasoline stations were up 1.6%. Excluding sales at motor vehicle and parts dealers and gasoline stations, retail sales increased 4.7% in 2017. Building material and garden equipment and supplies dealers (+12.7%) led this increase. Sales at food and beverage (+1.6%) and general merchandise (+4.7%) stores grew at a lower rate than Canadian store retailers overall, leading to a lower share of retail sales taking place in these subsectors in 2017. Internet-based sales from both store and non-store retailers rose 31% to $15.7 billion in 2017. Retail e-commerce represented 2.6% of total retail sales, compared with 2.1% in 2016. During the November and December holiday shopping season, retail e-commerce accounted for 3.5% of total retail sales, up from 3.2% in 2016, in part due to strong retail e-commerce sales in November 2017. Approximately one-quarter of retail e-commerce sales took place during the holiday shopping season. How do I interpret seasonally adjusted data when or if a series is undergoing a structural change? In certain circumstances, it can be more difficult to interpret movements in seasonally adjusted data when several factors are simultaneously influencing seasonal patterns (for example, the timing of product releases, popularity of promotional events). The seasonal pattern reflects repeated movements in recent data. Deviations from the estimated pattern are often interpreted as irregular movements in the short term. If these movements become a regular feature of the data over time, these new seasonal patterns would be gradually incorporated into the seasonality model. New time series information on these changes is necessary to establish a new seasonal pattern. Since the November 2017 release of September data, Laspeyres volume estimates by industry for the Monthly Retail Trade Survey are available under CANSIM table 080-0027. CANSIM table 080-0024 has been discontinued. Volume estimates and indices in CANSIM table 080-0027 have been revised back to 2012, reflecting a change in the classification of the retail commodity survey to the North American Product Classification System. Total retail sales expressed in volume are calculated by deflating current dollar values using consumer price indexes. 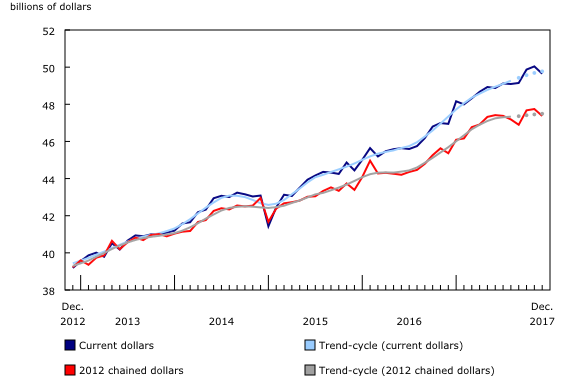 The retail sales series in chained (2012) dollars is a chained Fisher volume index with 2012 as the reference year. For more information, see Calculation of Volume of Retail Trade Sales. Real-time CANSIM tables 080-8020 and 080-8027 will be updated on March 5. For more information, consult the document Real-time CANSIM tables. Data on retail trade for January will be released on March 23. For analytical information, or to enquire about the concepts, methods or data quality of this release, contact Annie Xie (613-951-0385; annie.xie@canada.ca), Retail and Service Industries Division.